at the presentation on November 9, 2015 at Seminar Hall, EE Bldg. 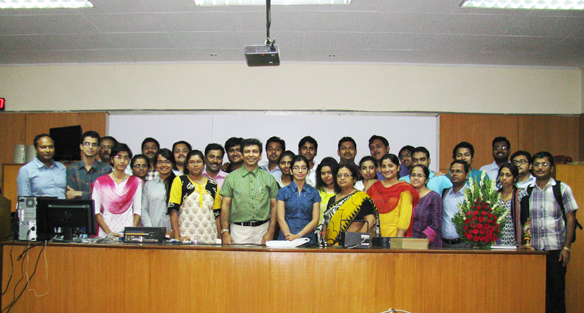 November 09, 2015, Monday, Jadavpur University, Kolkata, India. 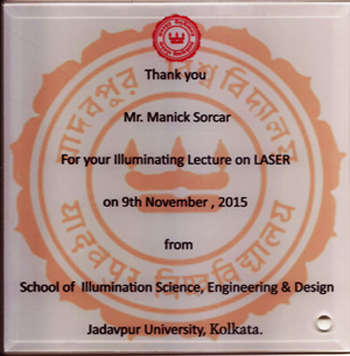 "It is my privilege to inform you that School of Illumination Science, Engineering and Design (SISED) has got an opportunity to have a presentation, face to face discussion and hands on demonstration on Laser by world famous Laserist Mr. Manick Sorcar on 9th November 2015 at 6 pm at the Seminar Hall of Electrical Engineering Department", said the announcement letter signed by Dr. Kamalika Ghosh, the current Director and Asst. 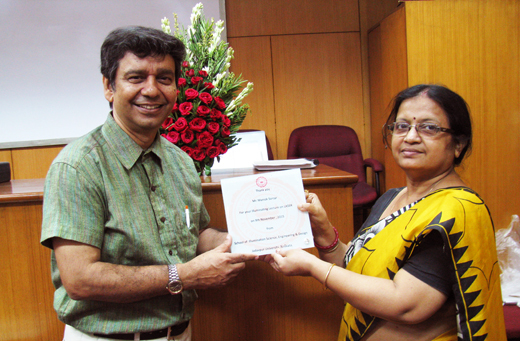 Professor of SISED, Jadavpur University, Kolkata. 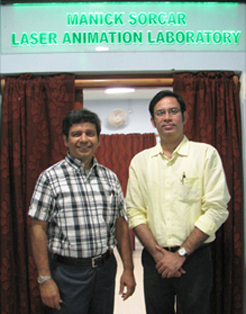 It was a pleasure for Manick Sorcar to accept the invitation for the special presentation at the school, where he had already introduced a course on Laser for Art and Animation in March of 2011 as a special application of lighting towards a degree in Illumination Engineering, and the trained faculty members were running it at the Manick Sorcar Laser Animation Laboratory. Today's presentation was a supplementary to that, and was attended by about fifty students, many from UG Final year Electrical Engineering Dept., Specialization in Illumination Engineering M.Tech (Illumination Technology and Design) under SISED, M.E. (Illumination Engineering) Electrical Engineering Dept., B. Arch Final Year Students interested in Laser, and some members of the faculty. Unlike other presentations at JU, this time Manick's topic was the "Many Uses of Laser Art and Animation for a Magical Experience" . After he was formally introduced by Dr. Kamalika Ghosh and felicitated with a bouquet of flowers by the students, Manick started his speech thanking his father, legendary Magician the Late P.C. Sorcar, for the hands on experience he had gained doing the art and lighting design for his father's world-touring elaborate magic shows that led to what he is today. "Lighting is the key element of a successful magic show; it plays with the psychology of the people all the time. Soon I realized I was more allured to the magic of mixing art with science - art with creative lighting - than doing stage magic and I was on my way to build a career on my own. Today I will share some of my personal experiences in laser lighting that were unique, drew international attention and got recognition from the International Laser Display Association." 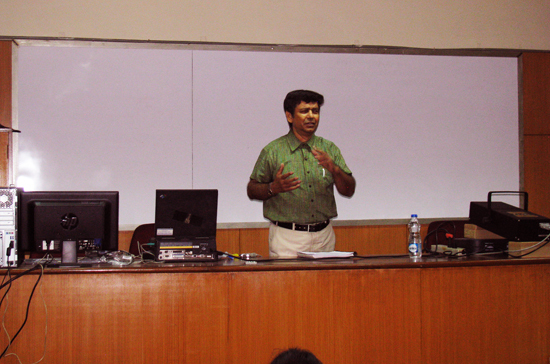 After giving a brief introduction to the physics of Laser and how it was produced today in solid state lasers, Manick explained how the software allowed to draw the artwork with a series of points along its perimeter and how two tiny-mirrors at 90 degrees to each other were responsible in "joining the dots" to create the intended art. He displayed a short laser show projected on the white board behind. "There is an artist inside each and every one of us, including the technical students", smiled Manick as he explained, "My job as a visiting lecturer is to wake up that part of you to do laser art and animation". Regarding its application, he said, "Don't have a tunnel-vision seeking opportunities locally. Your computer screen is the window to the whole world. Use your skills to meet the tremendous outsourcing demand of the West that exists in this field". After a tea-break Manick focused on the "Many Uses of Laser Art and Animation for a Magical Experience" , for which he shared a series of unique pictures from his own shows. There were scenes from "Calcutta Forever: A Laser Fantasy", 2000, at the Nandan Theater; "Dancing with My Soul", 2000, New Jersey that won a nomination for ILDA Artistic Award; "Beyond Boundaries", 2004, the Grand Opening item for the 24th North American Bengali Conference at Baltimore; "Feel Like a Kid Again", 2005, Denver, at the famous Pepsi Center stadium for the football match of Grand Raod Rampage and Colorado Crush; "Enlightenment of Buddha", 2005, DCPA, winner of the ILDA Artistic Award for Best Stage Show with Laser; "Horizon and Beyond", 2006, at IIT, Kharagpur; "LaserToons", 2006, at the Nicco Park that ran non-stop for a month and completed a total of 78 shows with multiple shows per day; "Reflection", 2008, winner of the ILDA Artistic Award for Best Laser Photography in international contest; "Our Republic's Birth", 2010, to celebrate the 61st Republic Day of India at the Palace of Fine Arts for the Consulate General of India, San Francisco; "Laser Magic at Light India International 2011", 2011, Chennai; and "Swamiji", 2012, an hour-long laser documentary on Swami Vivekananda that stormed the world from 2012 to 2014. He also showed videos of two of his popular laser shows of 2014 and 2015: "Light Art in Shower Ocean" and "Ae Ajagar Aaschhe Tere", that are hot items on YouTube drawing wide attention across the globe. "Light Art in Shower Ocean" received the ILDA Artistic Award last October 11, 2015 in Dubai, UAE for the most Innovative Application of Laser. Manick concluded his presentation with the remark Jadavpur University was the first and only place in India where a formal course on Laser for Art and Animation exists today and"You can find magic in anything if you set your heart on it". A short Question and Answer session followed the presentation, before it formally ended with the note of thanks from the school. The session ran for 3 hours. "Manick Sorcar Laser Animation Laboratory", 4th flr., EE Bldg., during a visit a few days earlier. 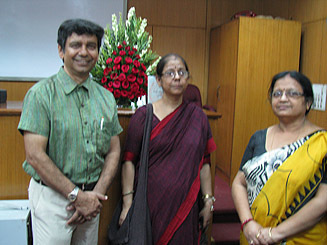 (Right) With Dr. Saswati Mazumdar and Dr. Kamalika Ghosh at the presentation on Nov. 9, 2015.
in establishing Manick Sorcar Laser Animation Laboratory.